You can create widgets for your Dashboard that will allow you to take a high level view of your groups data. This data can be displayed numerically or in graphs. You can also compare to previous data. The widgets are saved to the dashboard and you can even view campus specific data. To access the Dashboard, you will need to select the "Dashboard" tab at the top of your browser. To create your first view of the data, you are going to want to next select "+Add Widget". This will launch a modal that will allow you to create a widget. There are many variations of widgets you can create, below we will explain what you can do but the two main types of data you can display are numerical and charts. In this section, you will select the category that you would like added to your Dashboard. This will only include categories that you have added to your groups account. In this section you will select "Numeric" or "Charts". Numerical widgets are widgets that display your data in numeric format. Charts display your data visually on a graph. From this drop down you can select the range for which you want your data displayed. "Week", "Month", or "Year". In this area, you can select how large you would like your widget to be. NOTE: If you are wanting to create a comparison Widget, you will need to select the "1x4" size. This will only appear if the "1x4" size has been selected. You can select the data range from here. Here you can name your widget. It can be any name that you chose. 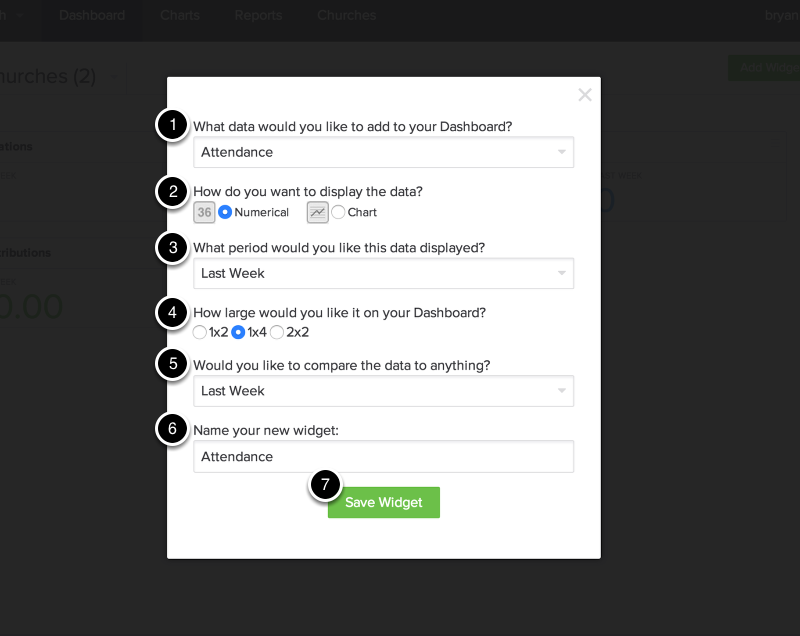 To finalize, select "Save Widget"
Now that your Widget has been created, you can view your data on your Dashboard. By Default, your data will include all churches. You can also, sort by church. The church name will be left justified and have the number of total campuses in parenthesis to the right. The final sort method is by campus, this allows you to see the data displayed down to the campus level.